Cardiff City's winless run was extended to seven league games as they were held to a goalless draw at Huddersfield. Cardiff, who have now drawn four matches in a row, had the better chances in a dour struggle. 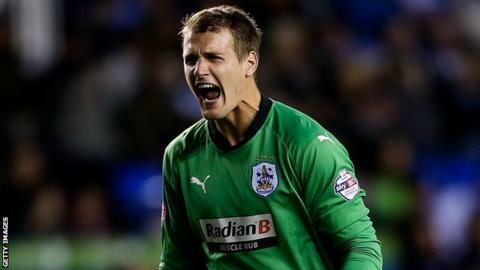 Terriers goalkeeper Alex Smithies denied Eoin Doyle with a wonder save on the half-hour, adjusting his body in mid-air to tip over his header. Huddersfield's Tommy Smith was lucky not to be sent off in first-half injury time for a foul on Kenwyne Jones. Smith, who was booked, appeared to be the last man when he brought Jones down on the edge of the box following a swift counter-attack by the Bluebirds. Cardiff City have not won any of their last eight games in all competitions, losing four times. Their last win in the Championship was the 1-0 victory at home to Fulham on 10 January. The home side had an early chance through former Cardiff skipper Mark Hudson, who headed over a Jacob Butterfield corner, while Cardiff keeper David Marshall smothered at the feet of Nahki Wells. Just after the restart, Matthew Kennedy's low cross found Peter Whittingham alone near the penalty spot, but the midfielder's shot was blocked by Hudson. Huddersfield went close through shots from Butterfield and Smith, while Wells had a header saved on 65 minutes. Cardiff, seeking only a second away win all season, soaked up Town pressure late on and hit on the break. A timely intervention from Murray Wallace denied Jones and a shot from Craig Noone was charged down on 89 minutes as Huddersfield battled to avoid a third consecutive home defeat for the first time in 15 years. Huddersfield drop to 16th place and are eight points above the relegation zone, with Cardiff one place and one point below the Yorkshire side. "I feel the referee was correct. Jones didn't have the ball under control and the yellow card was right. "We have been in a position where we have been drawing games and gone on to lose, so we have to take comfort in the fact we haven't lost and we have kept a clean sheet. "The game won't live long in the memory of anybody who was here." "It was only a yellow card for Smith and probably the referee thought we didn't have control of the ball. Arguably we did. "We got hacked down on the edge of the box but it was a difficult one for the referee. If we had been at home, it may have gone our way. "There was not a lot in the match. We had the best chance of the game with a great save from Smithies. If Doyle hadn't headed it so cleanly it probably goes in." Alex Revell (Cardiff City) wins a free kick in the attacking half. Corner, Cardiff City. Conceded by Jacob Butterfield. Attempt blocked. Craig Noone (Cardiff City) left footed shot from the centre of the box is blocked. Assisted by Sean Morrison with a headed pass. Substitution, Huddersfield Town. Joe Lolley replaces Jonathan Hogg. Substitution, Huddersfield Town. Harry Bunn replaces Sean Scannell. Attempt missed. Jacob Butterfield (Huddersfield Town) left footed shot from outside the box misses to the right. Assisted by Conor Coady following a set piece situation. Attempt missed. James Vaughan (Huddersfield Town) left footed shot from the centre of the box misses to the right. Assisted by Jacob Butterfield with a cross. Kenwyne Jones (Cardiff City) wins a free kick in the attacking half. Attempt missed. Aron Gunnarsson (Cardiff City) right footed shot from outside the box is high and wide to the right. Assisted by Conor McAleny. Corner, Huddersfield Town. Conceded by Peter Whittingham. Attempt blocked. Peter Whittingham (Cardiff City) left footed shot from outside the box is blocked. Assisted by Craig Noone. Substitution, Cardiff City. Conor McAleny replaces Matthew Kennedy.